Categories: Word, International, Top Games. For more than 30 years, WonderWord, has delighted and challenged puzzle players everyday. Each puzzle is built by hand from legendary puzzle creator, David Ouellet. Each puzzle is themed, often bringing in pop culture and trending topics. Monday - Saturday puzzles are a 15x15 grid and on Sunday the puzzle jumps to a 20x20 version for even more game play. 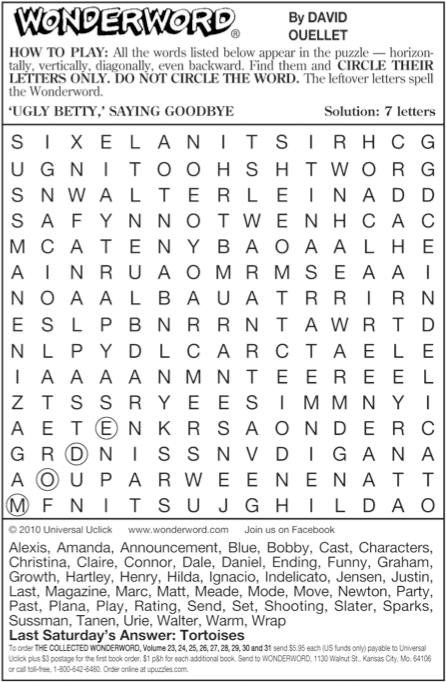 WonderWord is sure great for all ages and demographics and a perfect addition to any puzzle page. David Ouellet has been fascinated with words since childhood. A true "wordsmith," this native of Quebec City, Canada, is the creator of Teleword and Wonderword, regarded as the most challenging of all "word searches." 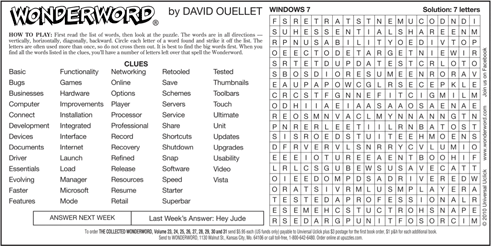 David was introduced to puzzle making by his mother, Jo Ouellet, who created Wonderword in 1970. Prior to syndication, David and Jo published puzzle books under various names, including Hide-A-Word, Find-A-Word and Chronogram, among others. David comes from a diverse family. His roots are Irish and French Canadian, and he is fluently bilingual. After earning a bachelor's degree in business from the University of Ottawa, David entered the business world and has held a variety of positions in the travel industry. An avid bridge player, David lives in Toronto with his wife, Sophie, and cat, Felicia.